Every industry has one; the prodigious talents whose comfort zones are outside of the box and for whom rules are more guideline than instruction. They’re the rebels, the misfits, the rulebreakers and the nonconformists. But equally, they’re the trendsetters, the innovators, the visionaries and the true talent. For New Zealand fashion, that’s Karen Walker. In 1989, at 19 years of age with just $100 in her pocket and two shirts in her commercial repertoire, she launched the Karen Walker label. Since then, she has steadily grown to be New Zealand’s most famous fashion export, with more than 1020 stores globally stocking her fashion, eyewear, jewellery, fragrance and paint collections, and a cult following from Lady Gaga to Madonna. With the ability to pair neons with pastels and floral prints with military touches in a way that only a true talent can, she has struck sartorial gold with her androgynous and offbeat designs distinguishable by their punchy, tomboyish edge. Metropol caught up with the sartorial powerhouse after a whirlwind trip to Dunedin where she was judging this year’s iD Fashion Week. What was a standout at this year’s iD Fashion Week? The stand-out for me, obviously, was our first prize winner, Damir Begović, but there were a lot of other collections that I thought were really excellent – I was very impressed and delighted to be there. How important is it to you to support emerging designers coming through the industry? I think it’s very important for anyone who’s well established in this industry to support emerging talent and iD Fashion Week’s got a great structure in place for doing this in a unique and outward-facing way. Karen Walker has become an iconic Kiwi label, why do you think it has been such a success and how do you continue to stay ahead of the game in such a constantly evolving industry? It all comes down to the ideas and we’re very fortunate that people like what we make. With regard to staying ahead of the game, I guess that’s just a result of us being interested in new ideas. What drew you to fashion in the first place? The feeling it gives you when you create or find something truly new/exciting/great. How would you define the Karen Walker brand? You’ve been involved with some pretty cool collaborations recently, including cookie mix and cute canine accessories. How much fun has it been to do something completely different? We’re in this business because we love to work with and create new ideas, especially ones that put a smile on people’s faces, and we’re always thinking about and working on projects that are new and exciting. We have to ask the cliché question – what are your biggest style secrets? A combination of lots of things really but the things that are important to me include: quality, a sense of self and a calmness within that, plenty of sleep and, for me personally, if in doubt… navy. And never, ever, ever counterfeits. 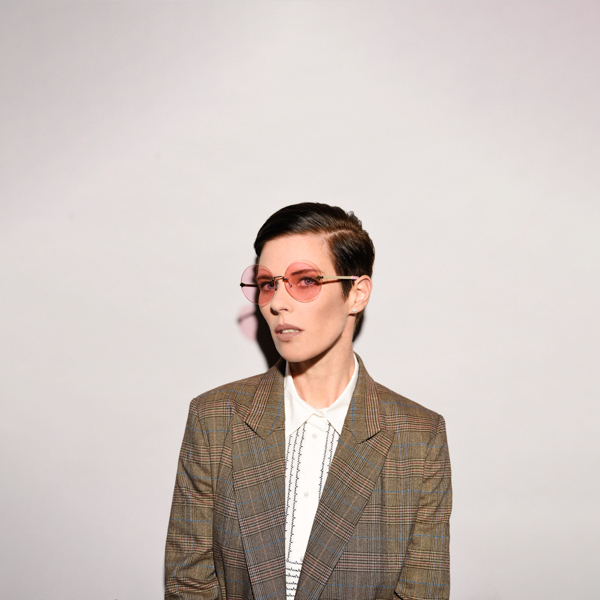 What can we look forward to from Karen Walker this coming year? Coming up in the second half of the year we’ve got new eyewear (guys and girls), new ready-to-wear and bags and a big, exciting, top secret collab to top the year off.